The great island kingdoms of the western seas have little to do or with each other. Nor, for that matter, do they have much to do with the rest of Faerûn. Each of them has its own people, history, and way of life, ranging from the shifting arrays of magical power surrounding the Elven Court on Evermeet to the brutal raiders of the Nelanther Isles. Sidebar: The Seas of Faerûn. Originally populated by sun elves, Evermeet is now the refuge for the Elven Court that has withdrawn from Faerûn. Moon elves, sun elves, and some wood elves followed Queen Amlaruil when she moved the center of elven life out of its ages-old home in the forest of Cormanthor. Evermeet is a defensible location far removed from human power centers such as Cormyr and Zhentil Keep. The magical kingdom of the elves lies eighteen hundred miles to the west of Faerûn in the Trackless Sea. Elven high magic, sea elves, vigilant wizards, and a powerful navy guard the island. Few approach Evermeet who are not already the elves' guests. The dignified and gracefully evolving life of the Elven Court pivots around the carefully smoothed passage of the seasons, giving life in Evermeet a stately cadence in which the decades blur into centuries of contemplative serenity. Nothing in human Faerûn compares to it. For the most part, the moon elves and sun elves form a single culture, though the noble houses, family lines, and clan relation ships color associations between individuals. The wood elves hold themselves somewhat apart, preferring a quieter relationship with the forest and its spirits, but individual wood elves frequently blend into the life of the Court. The sea elves are welcome to participate in the life of the Court but few do so for long. The handful of wild elves who opted to join the Court on Evermeet either carry themselves as the other elves of the court or live among the wood and forest spirits. To a non-elf, Evermeet looks essentially like a single huge forest. Elves can distinguish between the forest's regions, moods, and realms by reading the messages left over centuries of symbiotic relationships between trees and their elven wardens. Humans can only see the type of geography they're accustomed to - Evermeet's occasional wide meadows, fair rivers, and some impressive hilly ranges. Eagle Hills: From Thalikaera Rock, the highest peak of the range, lookouts can see all the way to the island of Sumbrar to the southeast. Using magic, they can see much farther. The Farmeadows and the Horsefields: The two largest meadows on Evermeet are representative of the dozens of smaller glades tucked in among the trees. Centaurs run free through the long grasses alongside moon-horses, the intelligent horses native to the island who serve and are served by the elves. River Ardulkh: Few humans penetrate the interior of Evermeet, much less ride a leaf boat from the River Ardulith's source high in the Silver Hills down to where it joins the River Shaelyn to flow into the sea in view of the queen's palace in Leuthilspar. Silver Hills: Like the Eagle Hills, these three-thousand-foot, conifer-lined peaks tower over the rest of the island. Lookouts keep watch from the peaks and tend to their giant eagle mounts in nests on the crags. Evermeet brims with wonder. No human land comes close to its integration of natural beauty and supernatural splendor. The elves compose wondrous songs describing and praising the ever-changing marvels of the island. The few humans welcomed to Evermeet's shores likely only see Queen Amlaruil's crown city. Corellon's Grove: The high temple of the chief deity of the elven pantheon can be found in the forest in the north of the island. It would be proper to say that the north quarter of the island is the high temple to Corellon, since it's impossible to know where the "normal" forest ends and the space holy to the great deity begins. More than any other place; Corellon's Grove is the heart of elven life on Toril. Leuthilspar (Metropolis, 50,269): The capital of Evermeet is a radiant example of the elves' organic architecture, in which buildings are grown rather than built. Even the coarsest dwarven miner would catch his breath at his first glimpse of Queen Amlaruil's palace. Crystals as tall as mighty trees are riddled with spiral passageways and glass-floored living quarters. Trees grow into citadels, linked bole to bole by fluting branches. Soaring arches and shimmering fields of magical force support airy palaces that seem too fragile to exist even in a dream. Eternally vigilant warriors and mages in armor of gleaming glass guard the tranquil city. Sumbrar: Sumbrar, a small island fifty miles to the east, serves as Evermeet's military and naval headquarters. The island is a series of interwoven magical fortresses. A thousand wizard-warriors stand ready there with their pegasus and eagle mounts. An armada of ships remains magically prepared for launch, secure in hidden sea caves. Deep below the island, the last twelve dragons of Evermeet lie sleeping alongside their riders, waiting for a threat worth their power. Uninvited vessels are warned off sternly - or, should that fail destroyed. The overall history of the elves of Faerûn is detailed elsewhere, particularly in the description of Cormanthor (see The Dalelands). Evermeet was settled by sun elves thousands of years ago. Over the last century the, elves of Cormanthor and other realms chose to remove themselves to this idyllic land, far from the ever-growing human empires and remorseless humanoid hordes that had destroyed so many elven realms on Faerûn's mainland. Yet now the Elven Retreat is at an end. All who were willing to abandon their lands in Faerûn have done so, and no more elves come to Evermeet to forget the human world. Although Queen Amlaruil's reign is just and fair, many elves - some of whom have been on Evermeet for centuries - find themselves dissatisfied with their withdrawal from the rest of the world. No one, least of all the Elven Court, has proclaimed an end to the Retreat or stated a determination to return. But more and more elves are choosing to return to Faerûn each year. Some intend to settle in Faerûn permanently or fight for ancestral lands taken by drow and other outsiders. Others intend to simply walk for a time in the lands they love, using secret portals to come or go as they please. Finally, Queen Amlaruil has quietly dispatched a number of agents and scouts to reestablish diplomatic ties with other friendly kingdoms. Evermeet no longer stands apart from events in Faerûn. Evermeet is not as safe as its "impregnable" magical defenses might indicate. In recent years, have dared to strike at Leuthuspar through magical portals, as if to remind Amlaruil that no haven is perfect. Forty-three years ago - a mere blink of the eye to an elf -Amlaruil's husband King Zaor was murdered in the heart of his palace, surrounded by, all the strength and splendor of his realm. 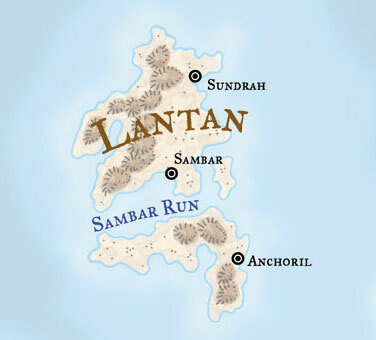 Folk hear tales of Lantan, "where Gond is worshiped and magic shunned." Most know very little more beyond the hearsay that Lantan is a strange and dangerous place where clockwork machines and infernal devices work great wonders and terrors at their makers' direction. Common wizardry pales in comparison. The humans of the island of Lantan pioneer technological solutions to problems that citizens of Faerûn solve with magic. The faith of Gond rules the pleasant island realm, and its inhabitants farm, craft things, and experiment endlessly. The Lantanese inventors constantly create new "small wonders" for the greater glory of Gond, and sometimes sell or trade these devices for glass, charcoal and other odd ingredients their clients require. Some Lantanese devices popular on mainland Faerûn include wagon suspensions and repairable sectioned wagon wheels; self-filling oil lamps that never go out as long as an oil tank is kept filled; various light-beam and tripwire intruder alarms; intricate hinges, chains, clockwork time-release devices, hasps, locks, and castings with special features (such as "stabbing pins" that can be poisoned to deter thieves, key-hiding cavities, catches that can ring chimes to announce the opening of a portal, and so on). The Lantanese have also created wind-driven fans, "snap-together" weapons, grapnels that.can be disassembled and concealed in clothing, and a variety of intricate needles and tools for sewing and surgical uses. A cold cluster of rocky islands cloaked in mists and deep woods and sprinkled with abundant beasts, bogs, and soaring mountains, the Moonshae Isles are shared by two dominant races of human folk. The northern section of the islands is dominated by seafaring Northlanders descended from the raiders of Ruathym. A darker-haired and darker-skinned human race known as the Ffolk, the islands' longer-term residents, control the southern part. The Ffolk thrive in a dozen petty kingdoms ruled over by a High Queen. In previous years the Northlanders and the Ffolk spent much of their time at each other's throats, particularly because of the Northlanders' penchant for bloody raiding. The rise of High King Tristan Kendrick unified the two peoples of the Moonshaes. Tristan's daughter, High Queen Alicia, has held her kingdom together through the usual small wars between petty lords. Compared to the nations of mainland Faerûn, the Moonshaes have enjoyed several decades of relative peace. All Moonshavians are shaped by the rugged, striking landscape and harsh weather. The Ffolk revere the land (and the deity who is the land), long aware of the divine power present in the rushing streams, secret pools, and mist-wreathed forests of their isles. The Ffolk adore their home with a deep and abiding love hard for other humans to understand. The Northlanders are less moved by the landscape. Their hearts are turned to the sea, and they tend to he boisterous and outgoing compared to their neighbors. Relations between the two peoples are often strained, even if they are better now than ever before. The Ffolk do not often welcome outlanders. To farmers, outlanders are trouble: brigands and thieves who imperil families, belongings, stock, and crops. To local lords and warriors, outlanders are rivals. If they abide by local laws, they are respected but watched: There's no telling what trouble will erupt if foreign sword-swingers run amok. News from the Sword Coast travels fairly well to the Moonshaes, so the previous deeds and reputation of arrivals color their reception. Heroes may be fully accepted by warriors of the Ffolk as one of their own. The Northlanders have a stronger tradition of sea trade and travel and tend to be simply curious about visitors from the rest of Faerûn. Outlanders are most likely to find employment as sellswords in the service of feuding lords, or as guards aboard Moonshavian vessels running to and from Sword Coast ports. The Nelanther isles are all too close for comfort, and the pirates grow bolder with each passing year. In every Moonshavian port tavern, one may hear a dozen colorful tales about narrow escapes. 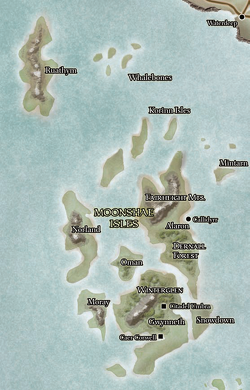 The Moonshaes consist of a handful of major islands and hundreds of smaller isles. Among the noteworthy ones are the following. 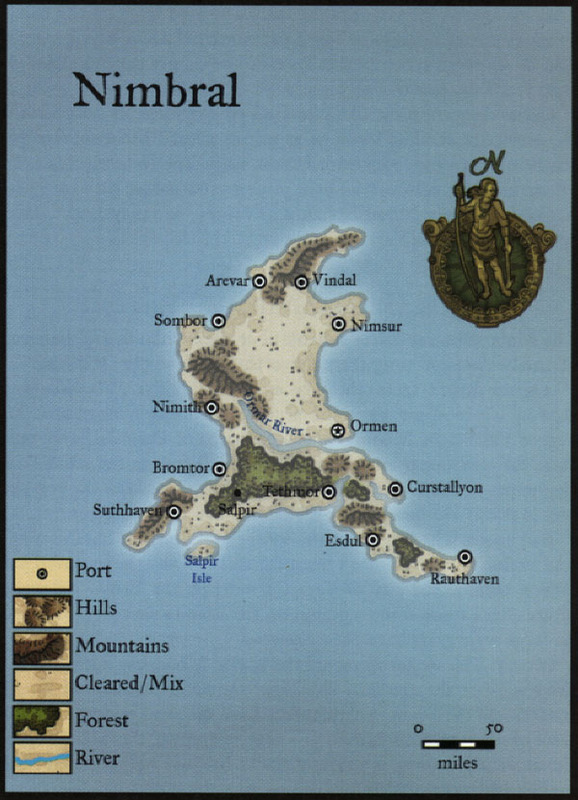 Alaron: Ruled from the city of Caer Callidyrr, the island of Alaron is the most powerful of the Moonshae's kingdoms. The rugged Fairheight Mountains to the north of Caer Callidyrr separates the traditional lowland homes of the Ffolk in the south from the homes of the Northlanders. Intermarriage between the two peoples is slowly eliminating the divide between their customs. Gwynneth: The largest of the southern islands, its northern half was settled by Northlanders from Oman's isle and the southern part (which became the city of Caer Corwelf) by the Ffolk. Nelanther pirates have made some landings on the island's southern coast, but no large-scale raids have been reported. Moray: The westernmost of the major Moonshae islands is also the wildest of the southern isles. Since the peace between the Northlanders and the Ffolk, Northlanders have taken to raiding the monsters of the Orcskull Mountains that run down the island's spine. Consequently, Moray is a safer place to live and has attracted Ffolk and Northlander settlers. Ruathym: This rugged, barren island is not properly part of the Moonshaes at all, lying more than two hundred miles north of the island chain. Ruathym is the ancestral home of the Northlanders, the barbarians who colonized the northern Moonshaes and Luskan. Scattered steadings and villages cluster around the isle's fjords and inlets. The largest settlement is the town of Ruathym, a city of five thousand. The Northlanders here have a long-standing feud with the folk of Luskan on the Sword Coast. Most of the Moonshae Islands boast at least one or two small villages. The major islands are home to dozens of settlements each, often divided by large stretches of wild and rugged terrain. Large towns are rare. Caer Callidyrr (Large City, 21,456): Caer Callidyrr is a leftover of a previous civilization's peak, a mighty castle built on the island of Alaron above a sprawling port city. The Kendrick family now rules the kingdom of the same name in addition to their ancestral holdings on Gwynneth. The wizards and sorcerers who directly serve the High Queen live in the castle at Callidyrr instead of going south to Caer Corwell. Unlike the rest of the Moonshaes, Caer Callidyrr is accustomed to the presence of visitors and merchants from other parts of Toril. Caer Corwell (Small City, 11,419): The home region of the Kendrick family, occupying the south half of the island of Gwynneth was the land first settled by the Ffolk. Its rocky shores and high moors make it an excellent place for strong-minded individualists who prefer space to neighbors, or for druids who seek to worship m the temple of the wild. Iron Keep (Small City, 1,730): The strongest fortress of the Northlanders perches upon the northern shore of Oman's Isle. Iron Keep was formerly the most feared and violent of the Northlanders' kingdoms. It's still a warlike realm, but its inhabitants' aggressions are spent on other Northlander kingdoms, particularly the isle of Ruathym. Myrloch Vale: The land sacred to the Earthmother occupies the central portion of the island of Gwynneth to the north of the Myrloch, the island's central lake. Unlike the aspect of Chauntea known throughout the rest of Faerûn, the Earthmother of the Moonshaes treasures unspoiled wildlands more than cleared farm land. Only druids and elves walk without fear in this place. The lands' primary occupants are centaurs, pixies, sprites, and the elves of the Moonshaes, known as the Llewyrr. Few of the Llewyrr joined the Retreat to Evermeet, owing nothing to the Elven Court and preferring their life in Myrloch Vale. Though the Vale is sacred to the Ffolk, Northlanders still fear it as a place of dangerous magic. For centuries, the cycles of history in the Moonshaes pivoted around struggles between the invading Northlanders and the Ffolk. Early in the 1300s DR, the islands' conflicts took on greater significance. The evil deities Bhaal, Malar, and Talos attempted to take possession of the Moonshaes from the Earthmother. The evil deities were thwarted largely through the heroism of the Kendrick family and their friends and lovers. The Kendricks ascended to become a new dynasty of High Kings and Queens, expanding the High Throne's Hold upon the islands and convincing the Northlanders to accord them fealty alongside the Ffolk. The last three decades of rule by High Queen Alicia Kendrick (NG female human Ftr6/Drd7 of the Earthmother) and her consort High King Keane (NG male human Wiz18) have been largely peaceful. Alicia and Keane have raised worthy heirs and appear to have founded a successful dynasty. The islands only significant problem at this time is a growing conflict with pirates from the Nelanther Isles, who are ranging north in search of better haunts. The Northlanders have proven to be excellent allies against the Nelanther pirates, but adventurers from the mainland can sometimes find employment fighting the pirates' deadly wizards. Although much of the vast Moonshae woodlands is little visited, there's a claim on every foot of land. Outlanders must seek permission from local druids before felling trees, or face attack. Dwarves already occupy the best sites for mountain strongholds, and giants and other monsters imperil the wilder reaches of the mountains. Nevertheless, the Moonshaes possess abundant wilderness where the strong can carve out holdings for themselves. Eager adventurers are reminded that founding a realm can take a lifetime, and is never safe or easy. The Wolf Still Has Fangs: The heroes are hired to accompany a merchant convoy bound for Amn that is too heavily laden to make good speed. They expect to be attacked by Nelanther pirates, and they are given one-use magic items to help them destroy their attackers, since the point of the trip is to draw a pirate attack and then smash it. The true predators on the convoy's route are Northlanders, whose Tempus-inspired battle frenzies and fast ships make them more dangerous than Nelanther pirates. Despite the Northlanders' peace with the Ffolk, some still raid Moonshae's neighbors at will. Worse yet, Northlanders captured or slain in the battle carry the colors of Iron Keep. Was Iron Keep framed for the attack? Or, if that city is responsible, would an attempt to enforce the High Queen's justice on the unruly Northlanders of Oman's Isle drive them into open rebellion and rekindle the old wars? The Nelanther isles are a widely scattered chain of nearly a thousand islands sprinkled from Amn into the Trackless Sea. More than half the islands lack water and are fit only for wrecking ships upon. The hundreds of islands that have drinkable water and can support life are fought over by seagoing pirates who prey upon the shipping of Amn, Calimshan, the Sword Coast, and the Moonshae isles. Aside from their dependence on violence and larceny, the Nelanthers have surprisingly little in common with the Pirate Isles of the Dragon Coast. 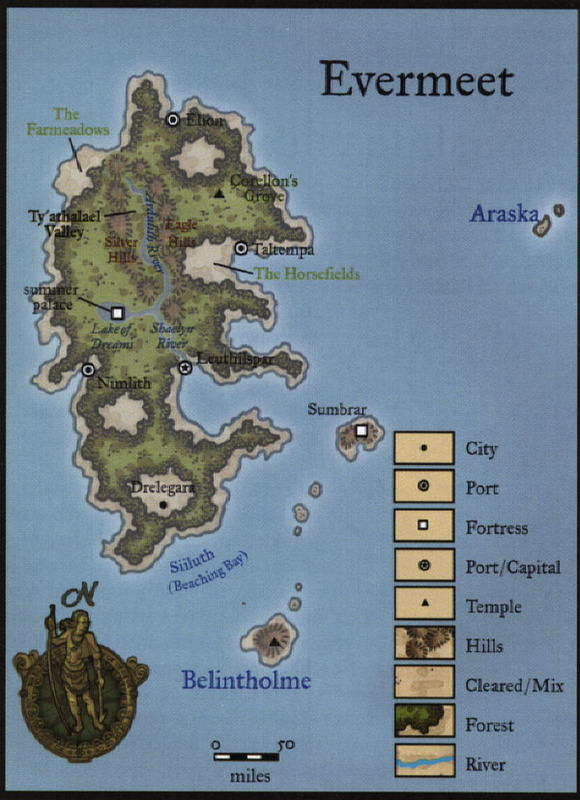 The Pirate isles are predominantly human, while the Nelanthers' pirates are non-humans such as orcs, lizardfolk, ogres, and minotaurs. The various races and factions of Nelanther pirates war on each other as often as they war on outsiders. The raiders of the Nelanther Isles live by the winds that fill their sails on the Sea of Swords and die by the gales that smash them to Umberlee's depths. Unlike the swashbucklers of the Pirate Isles who sometimes observe strange forms of chivalry, the Nelanther reavers torture their victims and leave them to hideous deaths. The pirates here are born into the society's violent cycle and escape only by dying, usually while young. Nearly all able-bodied adults fight aboard ships, while the weak, crippled, and surviving children are left ashore to make repairs or salvage wrecks. Aside from the Sea itself and the innumerable rocky islands of the Nelanther isles, there are no particularly notable features. No single island is large enough or densely settled enough to deserve special mention. Instead of erecting permanent settlements, the pirates of the Nelanther isles live in their ships or in huts that can be abandoned at a moment's notice. The only permanent structures in the area were built long before the arrival of the pirates. The Sea Towers: High towers made of hard stone jut out of several of the islands and occasionally straight out of the sea,. The sea towers of Irphong and Nemessor are leftovers of a previous civilization or civilizations. Most are magically locked and warded against intrusion by simple bandits (including Nelanther raiders who have tried to get in.) Others have become the homes of monsters such as ogre magi or Bane-worshiping gargoyles. In either case, the Sea Towers have a bad name among the Nelanther pirates, who avoid them with superstitious dread. Tethyr's Velen peninsula and the Nelanther archipelago have always divided Faerûn's northern seafarers from its southern waters. With the rise of the mercantile powers of the northern waters - Amn, Waterdeep, and the cities of the North - traffic through. the Nelanther Isles burgeoned into a rich stream of trade. And that activity, of course, attracted pirates like a battlefield draws crows. For centuries now, the Nelanther Isles have been more or less as they are today. The Sea Towers tell a different tale, though. The furnishings, scrolls, and tomes discovered within newly breached towers indicate that there was a time when the islands of the Nelanther were home to other than cruel tyrants and vicious buccaneers. Much of the history of this vanished civilization has been lost to the tides. Adventures in the Nelanther nearly always end up dealing with pirates. Wealthy merchants of Amn and the Sword Coast cities frequently outfit punitive expeditions to locate and destroy particularly successful or cruel pirate bands. Heroes from these lands cut their teeth chasing corsairs in the Nelanther. A Cell with a View: A one-way portal used to escape a villain's fortress leads to the top of one of the Sea Towers. While the heroes search for another way off the island, the pirate ships that "watch" the island for the villain to sail up, ready to transport their ally to the island containing her other portals. If the PCs decide to hole up in the wizard's tower instead of confronting the pirates, they'll soon learn the dangers of living within a functional tower without knowing the proper spells and passwords that keep the tower's defenses. from activating. Nimbral the Sea Haven is a fabled and seldom visited land that lies off the western coast of Faerûn, southwest of Lantan. it is a small realm of forests, high meadows, and deep green forests. Little farms and spired, fairytale castles dot the countryside. The small coastal sites serve as fishing ports and docks for infrequent visitors. Many believe the land to be a mere legend. The reclusive folk of Nimbral have a well-deserved reputation as great wizards. An enclave of studious, introverted, and extremely powerful archmages called the Nimbral Lords rule the place. The lords keep to themselves and split their time between governing and magical research. There are reputed to be more than two dozen of these lords and half as many apprentices, and they form a tight-knit, loyal family. They guard their secrets jealously, fearing attacks from groups such as the Red Wizards, the Arcane Brotherhood, the Cult of the Dragon, and, the Twisted Rune. Nimbral is also known as the land of the Flying Hunt. Aerial knights mounted on pegasi and clad in armor of glass patrol the skies and waters of the island, seeking out flying monsters and keeping pirates and raiders away from Nimbral's shores. These knights follow the highest ideals of romantic chivalry, though some (mostly Calishite slavers) revile them as raiders and bandits.